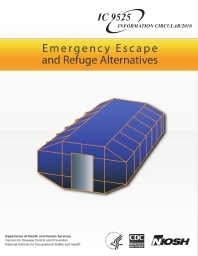 This training tool was created by a multidisciplinary team at the National Institute for Occupational Safety and Health (NIOSH) to teach miners about emergency escape and using refuge alternatives. The training is a Microsoft PowerPoint presentation and is intended for group-based training. The presentation can be used as-is, or it can be customized to reflect the specific policies and refuge alternatives of the mine and requirements that may be unique to a specific state. The training is a safety talk with a duration of 15-30 minutes. Audience: Underground miners at all skill levels. This training product can be integrated into required new miner training courses, annual refresher courses, or any other mine site training.